The Gospel reading for July 29 is Matthew 20: 1-16, the Parable of the Laborers in the Vineyard. This parable can have several layers of meaning. It has been seen, for example, as a description of the various times in life, represented by the hours of the day it mentions, at which people might come to know God. Some have faith from their early youth, some find it in adulthood, and some discover it when they reach old age. We can also look at the parable as Christ’s direct challenge to us and to our attitude toward other people. In verses preceding the parable (19: 27), Peter has asked the Lord: “Lo, we have left everything and followed You. What then shall we have?” Jesus answers that everyone who has left anything for His sake will have it restored a hundredfold. He adds, “But many that are first will be last, and the last first.” The parable follows. 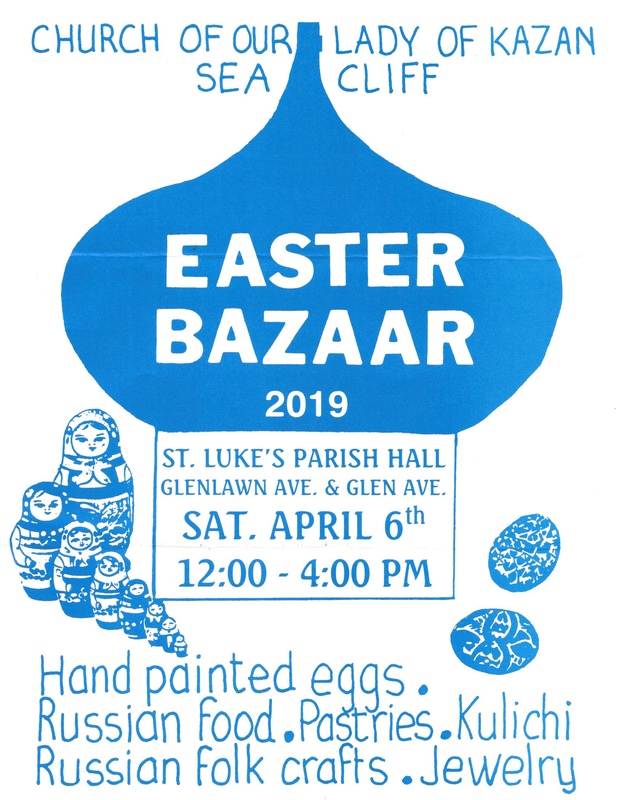 Jesus compares the kingdom of heaven to a householder who hires laborers to work in his vineyard early in the day, offering to pay one denarius to each. A few hours later, he hires more workers and tells them they will receive “whatever is right.” He does the same with other groups of workers as the day goes on. The question is there to consider: “Do you begrudge My generosity?” To begrudge is to keep score, to resent the fact that someone we consider less deserving gets as much as we do. The parable calls us to give up keeping score. On this day we remember a saint who didn’t keep score. The martyr Callinicus was a Christian native of Cilicia, in Asia Minor, who was arrested for refusing to worship idols. The pagan governor saw that people admired Callinicus’ courage, so he exiled him, not wishing to risk the crowd’s anger by executing him. The soldiers guarding Callinicus on the arduous journey into exile became overwhelmed with thirst. He might have let these pagan servants of a pagan governor suffer, considering them unworthy of the mercy of his God. Instead he prayed, and God sent water trickling from a rock to refresh them. You worthily inherited joy on high, Callinicus, for aflame with love for Christ you bravely endured the fire. As you stand before Him, never cease to intercede for us all. Callinicus didn’t begrudge God’s kindness, and perhaps that day some pagan soldiers saw for the first time what the true God is like. Perhaps they also saw that a Christian, even when life seems unfair, doesn’t keep score. This entry was posted in Education, Sunday to Sunday with DCE on July 29, 2015 by gldstrm. During the week of July 19, the Church remembers two saints who showed deep love for Christ by doing things that go far beyond what most people would be willing to do. The first is Saint Seraphim of Sarov. On July 19 the Church celebrates the transfer of his relics from his original place of burial to the Church of Sts. Zosimus and Sabbatius, and then to the Dormition Cathedral in Sarov. Over 200,000 people paid their respects to the beloved saint, and many healings took place during the procession with his relics. Saint Seraphim was working in his garden when he was attacked by robbers. Rather than defend himself or use his heavy garden tools to fight them off, he allowed them to beat him badly. It was after that incident that his injured back was permanently bent and affected his walk. For most people, the idea of not even trying to defend ourselves from an unjust attack is unthinkable. But Saint Seraphim’s Christlike love for God’s creatures made him unwilling to harm any of them, no matter what the circumstances. 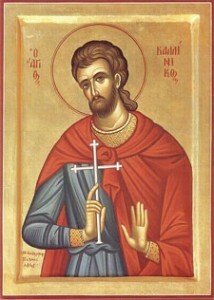 The second saint, commemorated on July 21, is the Venerable Simeon of Edessa, Fool-for-Christ. Like Saint Seraphim, though in a different way, he showed Christlike love that would be difficult for most people to manage. He called people to repentance by feigning madness. He would bound around crazily in the streets and approach people, whispering their sins in their ears and urging them to repent. Sometimes he appeared in dreams and reminded the dreamers to repent. To do this, of course, he had to have insight into people’s deepest secrets, which he did. Adorning his soul with the most radiant virtues! Simeon, the equal to the Apostles and the Bearer of God. Together with him, let us honor his companion John, For they both ever stand before God, interceding for us all! This entry was posted in Education, Sunday to Sunday with DCE on July 19, 2015 by gldstrm. On July 14 we remember two saints, one who lived during the first years of the Christian Church and the other who lived just a few hundred years ago. 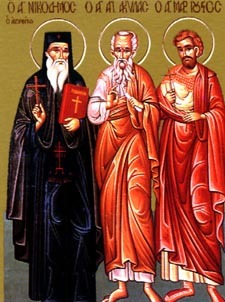 They are the apostle Aquila from among the Seventy, and Saint Nicodemus the Hagiorite. Aquila and his wife Priscilla, were friends and co-workers of Saint Paul. 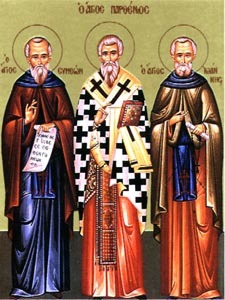 All three were born into Judaism, became Christians, and taught the faith to others. In Romans 16:3 Paul writes that Aquila and Priscilla “risked their own necks for my life.” It isn’t clear what he is specifically referring to, but obviously the couple acted bravely at some time when their courage saved Paul’s life. Paul then writes that not only he, but “all the churches of the Gentiles” are thankful to the pair, who offered their home for Christians to meet in. This was another way in which Aquila and Priscilla gave the best they had so that the Church could flourish and its great leaders could continue to teach. According to tradition, Aquila gave his very life, killed by jealous pagans. 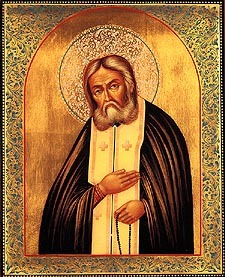 Saint Nicodemus the Hagiorite (which means “of the Holy Mountain,” referring to Mount Athos) was born in 1748. He became a monastic on that mountain when he was twenty-six. For the rest of his life, he would work at writing and editing some of the most important books and texts we have in the Church. He prepared himself well for this work, using his prodigious memory to learn by heart the Scriptures and many writings of the Fathers, and bringing his knowledge of Greek to a level of near perfection. The work began when he was assigned, along with Saint Macarius of Corinth, to edit a manuscript of the “Philokalia,” a collection of spiritual writings of Fathers from the fourth to fifteenth centuries. The two monks chose the contents of the book based on their availability. They included pieces that had never been published and were not accessible anywhere else. Some pieces had appeared in other publications, but these were worm-eaten, crumbling texts that were nearly impossible to read. Saint Nicodemus’ preface to the “Philokalia” emphasizes that the book is meant to inspire all Christians, not just monastics. He was always eager to share good Christian teaching from any source. For example, he produced an edition of “Unseen Warfare” by Father Lorenzo Scupoli, a Roman Catholic. During the remaining years of his life Saint Nectarios continued to work intensity. He wrote hymns, a book on Christian morality, a manual for confession and accounts of the lives of saints. 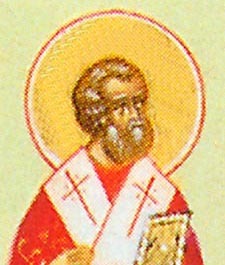 He produced a new edition of the “Rudder” and translated a three-volume work on the Pauline epistles by Saint Theophylact. Aquila, we all acclaim you. This entry was posted in Education, Sunday to Sunday with DCE on July 14, 2015 by gldstrm. The Gospel readings for the week of July 5th include Matthew 13: 10-43. These verses come after Jesus has just told the crowd the Parable of the Sower. It describes various kinds of ground, and the seeds that fall on the ground as the sower works. Some seeds die because they are scorched by the sun or choked by thorns, eaten by birds or withered in soil that isn’t deep enough to sustain them. But the seeds that fall on good soil bring forth abundant grain. In verse 10, the disciples ask Jesus why He speaks to the people in parables. He answers: “The reason I speak to them in parables is that ‘seeing they do not perceive, and hearing they do not listen, nor do they understand. '” His words are close to the message the prophet Isaiah is commanded to give the people (Isaiah 6: 9-10). Commentators on this passage note that the Lord’s words have different meanings for different kinds of people. Those who are willing to hear and spiritually sensitive will gain understanding. But those who are hard-hearted, who are unwilling and spiritually insensitive, will only hear a story. They won’t heap up condemnation on themselves by rejecting the message Christ is giving in the parable. So Christ makes His point in this way as an act of mercy toward those who do not want to hear Him. They are represented, in the parable, as the seeds that fall “by the wayside” as the King James Version has it. But to see this miracle, a person must be patient. The miracle only happens over time, just as a small, frail seed can grow into a lush plant only with time and with patient, unhurried tending by the sower. This entry was posted in Education, Sunday to Sunday with DCE on July 5, 2015 by gldstrm. On July 2nd the Church commemorates a saint and an event, both of which remind us of the central place in our theology of Mary the Theotokos. 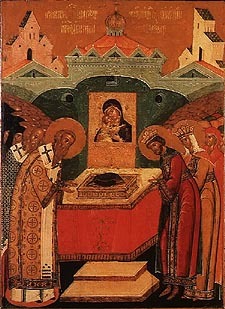 The event is the “Placing of the Honorable Robe of the Most Holy Mother of God at Blachernae.” It took place in the year 458 at the church in Blachernae, a suburb of Constantinople. 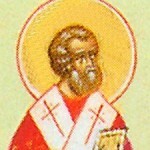 The saint is Juvenal, who served as Patriarch of Jerusalem from 420 to 458. The story of the Theotokos’ robe begins with two brothers from Constantinople named Galbius and Candidus. They set out for Palestine to venerate the holy places there, and near Nazareth they stayed with a devout elderly woman. She told them she’d been caring for a sacred item in her home: the Theotokos’ robe. Near the end of her life, the Mother of God had given it to a pious maiden, and it had been passed down through generations of that maiden’s family. Many people in ill health or distress, she said, received healing by prayerfully touching the robe. Saint Juvenal was an excellent theologian who attended both the Third and Fourth Ecumenical Councils. At the Third Council, in Ephesus, he insisted on the term “Mother of God” to describe Mary against those who claimed that she could only be called the mother of Christ. Giving her that diminished title, he argued, would be denying that Jesus is truly the Christ, both God and Man in one Person. Saint Juvenal had to defend the Church’s teachings at both Councils, and did so successfully. But his opponents in Jerusalem continued to spread their wrong beliefs, and managed to have Juvenal removed from his position as Patriarch. They installed a man named Theodosius, who at first had the support of the empress Eudoxia. Fortunately she was convinced by Saint Simeon the Stylite to adhere to the Councils’ decisions. Juvenal’s position was restored, and he served the Jerusalem church as patriarch for 38 years. On July 1st we read Jesus’ own words about seeking the truth. He says, “The queen of the South will rise up at the judgement with this generation and condemn it, because she came from the ends of the earth to listen to the wisdom of Solomon, and see, something greater than Solomon is here!” (Matthew 12: 42). The Queen of Sheba made a great effort to hear truth from Solomon. God has given us ways to know the truth, too. Those at the Councils used their God-given minds to work out that Mary is rightly called Mother of God because her Son is the Divine and Human Savior. God also gave us a tangible proof of Mary’s holiness: a Robe that drew people to Christ by healing and renewing His people. This entry was posted in Education, Sunday to Sunday with DCE on July 2, 2015 by gldstrm.